Need Help Choosing A Garage Door in the Monterey or San Jose CA Areas? Buying a new Overhead garage door for your home can be an exciting process. An overhead garage door provides a visual focal point for your home and updating your door can enhance your home’s curb appeal. Here we provide some information to help you with your shopping to ensure you have the best experience with your garage door purchase. 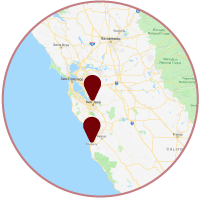 Remember, Aaron Overhead Door has been serving the San Jose and Monterey, CA areas since 1968 and we are a great choice in providing you with excellent service for your new garage door purchase and installation. Choose your favorite garage door style. With the many choices we offer with each material, use our Garage Door Designer Tool to help you pick the best look and options for your home. Pick an experienced garage door dealer in your area. In case it isn’t obvious, your best choice for garage door sales, installation and repair in the San Jose, CA area is Aaron Overhead Door. Being family owned and operated since 1968, we know the garage door business and we know how to provide our customers with the service and attention they deserve. Many home improvement “gurus” warn homeowners against trying to install or repair their garage doors on their own. You will see these warnings in virtually any garage door buying guide you read. Avoid any unneeded frustrations or accidents by contact us today for an Estimate on your garage door project. Family owned and operated since 1968. Extensive knowledge of garage doors and garage door repair with a great local reputation (A+ BBB rating). Professionally trained installers and technicians are employed by us (not subcontracted out) and are fully insured. We are a drug-free business. San Jose and Monterey, CA areas. Monterey residents, please contact us today for an Estimate and take the next step in adding a new look to your home.